I had my first day of working as a tutor and I'll admit it's tougher than I though it would be. At the very least, I know that I need to brush up on some of my basic math skills in order to do this as well as I need to. I'm fine with most of it, but being nervous is not a quality that is conducive to teaching. I had dinner with my uncle, dad, and Teenie tonight at Love Sushi and got to see friends afterward, and am hopefully not going to be too nervous tomorrow (or any day hereafter). My mom traded some of her Gouldian finches for some Owl finches today - they're so cute! We don't have names for them yet, but we'll think of something. As for the rest of the day - I spent most of it cleaning up my room and getting everything squared away, I start work tomorrow (I'm a little nervous). Drove home today - it was a super long ride but now everything is moved out of the former San Francisco apartment (insert tear here). I'm really truly sad to leave this beautiful city - ironically I captured some of the best images of the city on my last night here. I don't want to leave, but I can promise I'll be back. 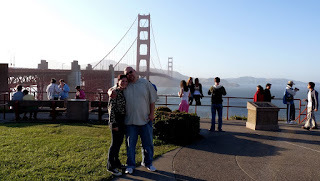 We got to the bridge just before sunset - before meeting up with Teenie's friend Lauren and our respective families at Mona Lisa - but I had to take Jason down Lombard Street too before that. 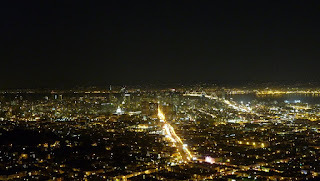 After dinner (which was fabulous as always), we headed up to Twin Peaks where we got the clearest (and warmest, it was something around 70 degrees up there) view of the city I've ever seen. We spent the whole day packing up a U-Haul to bring to storage, it took forever. But now we're all set to finish packing up the cars and leave the city tomorrow (and my emotions are all over the place). Bunny and I headed back to San Francisco this afternoon and in the evening I met up with my parents, sister and Jason to have dinner at Pier 39. We ate at Bubba Gump's (like we did 2 weeks ago) and had a nice time sightseeing a little bit. I didn't have the heart to stay at the apartment now that 90% of everything is packed up and gone - so I stayed at the hotel with everyone else - which is a surreal feeling, like staying at a hotel when home is just around the corner. But I guess it's not really my home anymore (San Francisco is, but I don't have a place to live in it anymore). Tomorrow we have to finish moving everything to the storage locker. 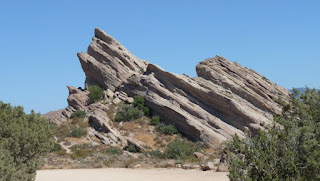 Bunny and I spent the day touring the town that I grew up in - I showed her the schools I went to and places I knew - and we ended up at Vasquez Rocks off of the 14 freeway. Check out this link I found for a very nice write up of how Hollywood has used them- Odd Things I've Seen. Not mentioned in the post is that these were inspiration for The Lion King's "Pride Rock" (although I'm probably more interested in seeing the Star Trek episodes they were in). Bunny took some great photos as we headed down to SCV to move the last of my stuff out of San Francisco. It's really nice that she came with me though - it made moving a lot easier than having to drive away all alone. She's never been to Southern California, so I'm really excited. My cousin Jason is also in town, I haven't seen him in something like 8 years. The next few days should be good. USF is using http://www.citygrazing.com to clear up the hard-to-mow areas of the campus property, which means that there are 57 goats roaming around the middle of San Francisco eating the weeds. They're a lot of fun to watch (they've apparently escaped a few times), but are really skittish - I got to pet one though. They were parked outside, I thought it was beautifully ironic. Today was cleaning day - the morning was spent scrubbing the inside of the refrigerator (not a pretty thing) and the afternoon was spent cleaning the oven and windows (and I am so sympathetic to owners of ovens that aren't self-cleaning). Does anyone realize how ridiculous the warning label on Easy-Off is? Basically, if you use the stuff, you're probably going to be poisoned...So now I too am probably poisoned, check back next week and see if I'm still blogging (and I don't mean to see if I've once again fallen behind on posts). The day was also spent tying up some loose ends - namely, Dim Sum. I had to have it from my favorite place once more before I left (their cha su bao is so great!). I also picked up a bottle of my newfound favorite hot sauce from Lucky's (just in case it's not in SCV). Tonight we watched Wall-E again, but this time we turned on the Pixar "geek track" commentary - which basically turned the movie into Mystery Science Theater 3000 to our great amusement. And finally - there's a Woot-off - watch the flashing lights. 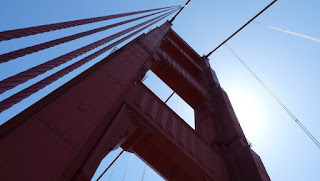 Bunny, Joe & I spent the day walking across the Golden Gate Bridge (and subsequently got sunburns), snapping photos and enjoying the rare San Francisco sun (in all of its firey, burning glory). We then proceeded on to the sushi boat restaurant for a feast of fish and finished the afternoon off with a friendly competition of scrabble (and Bunny crept up on us and won at the end). 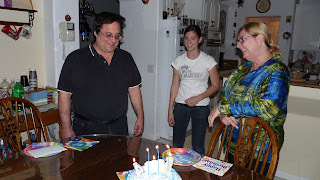 Then we once again drove to the end of the world to drop Joe off with his big box of art supplies from Marie and finished the night off with frozen dinners from Safeway (I had Claim Jumper's lasagna & Bunny had an enchilada). Bunny and I spent the afternoon wandering around in the park and watching the dogs go by. Saturday was finally a lazy day to lounge around since work is over, and there's a few more days before packing/cleaning gets frantic. This evening we watched Wall-E on Blu-ray, and really it's got to be one of my favorite if not my most favorite movie ever. After the movie was over I bought the Peter Gabriel song "Down to Earth," which plays during the end credits. Today was my last day working for Desktop Engineering at USF - and in parting my boss bought a cake from, where else, Schubert's. I'm sad to be leaving ITS, I feel like I contributed a lot to the group, writing hundreds of documents with dozens of revisions for each one (I have over 900 files on my thumb drive!). I'm hopeful that one day I'll be able to return to USF for more work (and perhaps graduate school), but I'm taking a lot of knowledge and skillsets with me from now on. The environment of ITS was very educational, with time being taken to explain how things worked, not just how to perform various tasks. 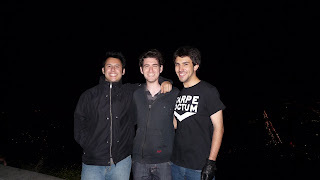 I'm proud to have worked with the DE group, and hope that the work I've done proves to be useful in my absence. At any rate, I wouldn't have traded the last year for anything, working in ITS was a blast. 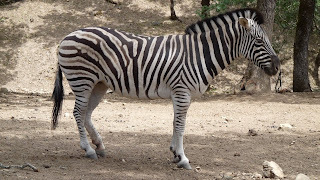 Black with white stripes or white with black stripes? 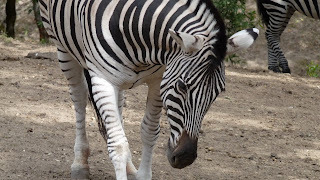 Two zebras for the price of one! (Although I'm pretty sure this is the same zebra in both pictures). I didn't post any on Friday so here are two! And equally amazing is that I'm actually posting a blog on the right day! This afternoon was spent exploring the fancy houses up in Pacific Heights and making sure that I don't have Tuberculosis (what a shock). I also installed the new iPhone software 3.0 today - it's going to take a little getting used to, and I miss some of the tweaks I used to have, but it seems a bit snappier than it was, so I'm going to stick with it. Best feature? Landscape keyboard in text messaging and email. Bunny and I dropped off some chairs at the storage locker this afternoon - the weather was pretty gloomy but we had a nice walk in the park and played on the swings for a while. There really wasn't a whole lot else going on today - just some packing and lounging around. Are we lying down? or is that a couch on the wall? Another Saturday picture, this is our little storage space filled up with our furniture. The door in the back opens up and we needed a forklift to get the sofa up. Today Bunny & I had more frozen yogurt (it's irresistible, I wish I had discovered it sooner) and watched more Arrested Development. I also got the first stage of my TB skin test this afternoon - the shot didn't hurt (I hate shots!) but I still have to go back on Wednesday to get it read (if there's no bubble...I don't have Tuberculosis) Spoiler: there's no bubble now. From packing on Saturday - I decided to just sit in the u-haul after a while (it was getting frantic in the apartment). Sunday was a little bit more of the same (but we only packed up the van, and didn't go back to the storage space). In the afternoon all I did was clean up a bit, listen to some of my book, listen to some podcasts about Apple's newest products, and waited for Bunny to come over. And then we started our new found enjoyment of Arrested Development - a show that's been canceled for years, but we had never seen any episodes. They're silly, but funny and well written. There's 3 seasons to watch, and without a living room, not a whole lot to do in this apartment when we're inside, so we can pass time with the laughs. 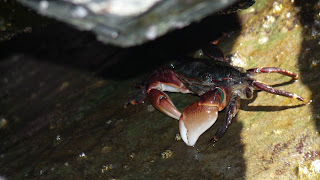 This crab lives in Sausalito, not Safari West - but I still loved getting this picture of it when Eman was visiting last weekend. It reminds me a lot of the crabs I saw in Nicaragua, but the setting is better here. We did so much moving today - we packed up pretty much all of the living room and dining room furniture (we don't even have a couch anymore). I'm pretty much confined to living in my bedroom now, the bedrooms are the only livable spaces now, and those will be packed up in the next week pretty much. 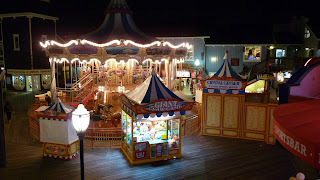 My parents are in town this weekend to help with all of the moving, and we had dinner at Bubba Gump's on Pier 39 - very tasty (although a little salty) but it was a lot of fun having a big seafood dinner and spending time together. I know, it's a TON of pictures, but this is partly a gift for slacking off lately and not getting new pictures up every night - but also because look at how awesome Safari West was! 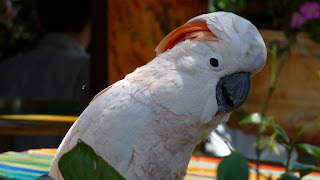 There were amazing and beautiful animals around every corner, and 90% of them weren't in cages. Truly a unique experience, I can't wait until I get a chance to go back. The day was perfect, I had a fantastic time with Bunny and we finished the night off wonderfully with a sushi dinner :) A little more about Safari West - 400 acres of land with somewhere in the neighborhood of 800 animals at any given time. The animals pictured are a lemur, giraffes, white rhinos, macaws, cheetahs and a monkey (not exactly sure what kind but it's an African one). 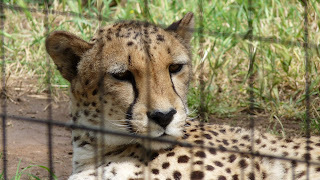 They also had many species of antelope and gazelle, wildebeest (aka gnus), cape buffalo, zebras, impalas, a serval cat named Bubba, and a huge aviary with dozens of bird species. 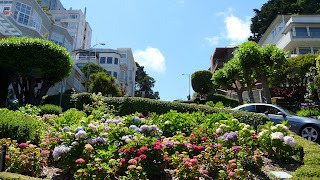 Bunny captured this image as we went down Lombard Street with Emmanuel on Saturday. Today we ended up back downtown to get MORE frozen yogurt (it really is that good, and kinda good for you!). Tonight we started watching Arrested Development on Hulu - and I have to admit, it really is funny. We watched the first 4 episodes (there's 3 whole seasons though) and I'm intrigued to see where the story lines can go. It reminds us of The Royal Tenenbaums (a Wes Anderson movie from 2001). 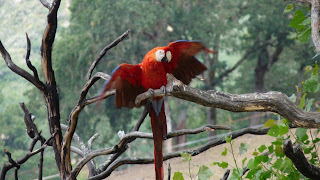 Tomorrow is going to be really exciting - we're going to Santa Rosa for our safari! There should be some great photos up soon. 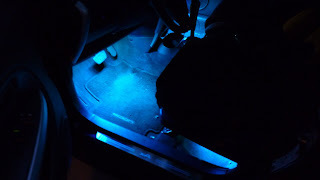 I installed these color changing LEDs in my car yesterday - they cycle through 7 or 8 different colors. The bars are in the footwells of the front seats and under each of the front seats to put light into the back seat as well - they're a lot of fun, and the controller has a ton of different modes to cycle through the colors - or just pause on whatever color you like best. So now the stereo screen, the box in the center console, and my floors all cycle through colors - which is awesome. Driving back to SF was really tiring - I listened to my book and all was fine, but just the sheer amount of driving I've had to do has been pretty draining. I also brought back a bunch of study materials to prepare for tutoring - I'm actually happy to brush up on my geometry skills. Driving home this morning was pretty great for once - since Eman was in the car with me, I had company the whole way down. 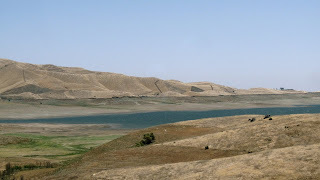 We didn't leave too early - we had to stop to get some sourdough bread for his family & my neighbor, but we got on the road quick enough and had a wonderful time getting back to SCV by the mid afternoon. Upon arriving, Teenie & I quickly went to get my dad his birthday present (a Blu-Ray player!) and installing the new color changing LEDs in my car (more on that tomorrow). My dad also got an awesome present from Marie (but it's a little bit of a secret until after father's day). Tomorrow is going to be a long day - I have a meeting at work and then I have to drive back to SF. Emmanuel FINALLY got to come to SF to visit me! We did SO much today. We had lunch at Orphan Andy's, walked around Golden Gate Park and fed the squirrels, explored the city in the car, wandered the Ferry Building, had a sushi dinner, and finally ended up on Twin Peaks. Bunny joined us the whole day (except for picking Eman up from the airport) and Joe joined us for dinner, cake & T.P. Spent the afternoon roaming around the city with Bunny, we were walking along the beach and saw a huge group of seagulls trying to open this bag with a bagel in it. Finally these two shredded it open to get to the bread contained within. 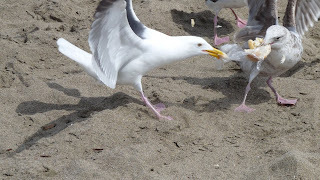 The white seagull was actually pretty mean looking - and really protective of his bag. I don't think he got very much of the food when all was said and done however. We also watched Bedtime Stories on Blu-Ray - I liked it the second time around - but feel as though the whole "Digital Copy" that comes with the movie is just an overly complicated, locked down version of DRM video that would be easier overcome by just using DVD-ripping and encoding software. I don't like the idea that I can only copy it ONCE and then I have a useless disc sitting in the case that can never be used again. My day of birth it was. Bunny took me out to a wonderful restaurant downtown called The Fifth Floor (it really is on the fifth floor of the Hotel Palomar). We had some really interesting and flavorful food - from the roasted pepper stuffed tuna balls and crab bisque cappuccino to my honey glazed and roasted duck with turnips and radishes to her lobster sauced chicken and hazelnuts. We were there really early for the dinner service (although I'm not sure how 7 pm really classifies as super early, but the place was empty) and were treated to a really interesting amuse bouche of a three-grain salad (quinoa, millet and corn) topped with a pineapple ice and another amuse with a citrus prawn. The pineapple over the grain was really tasty despite the odd combination of ingredients. Prawns are always delicious, as was the entire meal. When we didn't order dessert (Marie and Nick got me a cake and Bunny and I had chosen pastries from Schubert's) they brought us a small plate of 6 different little cookies and treats - all of which were also wonderful. I would love to go back there some time, the place oozes elegance and style (but it was still comfortable and not stuffy). Bunny also bought me the wonderful teapot pictured above, sitting wonderfully next to the teacups I received from my aunt and uncle and cousins. I only wish I had remembered to bring back the international teas my dad got me in Germany - but I'll have them next week so not all is lost :) Bunny also gave me the Royksopp CD: Melody A.M., one of my favorite albums of all time. All in all I had a WONDERFUL birthday and couldn't be happier. I drove back to San Francisco this morning/afternoon. Again, I was listening to Anathem on my ipod to pass the time. The book is getting very interesting and starting to pick up pace, which is nice after 9 hours of listening. I also got an interesting phone call this afternoon - one that I had to actually stop off the freeway to take. Basically, I had sent my resume out to some marketing opportunities listed on Cragislist. Well, one of them called me back today, and asked for an interview. I was pretty excited, until I looked the company up online and found out that it's basically a pyramid scheme selling internet service door-to-door. Needless to say, I won't be attending the interview in the morning. I know this will post as Tuesday, but everyone knows by now that I have a tendency to write this blog after midnight, so really, let's talk about my birthday. 22 has arrived and I'm looking forward to the dinner Bunny and I will be having :) And then of course, there's this baby photo that my dad dug up while we were looking at slides on Sunday. Last day in SCV for a week - we summed it up by going to see the LA Dodgers play against the Arizona Diamondbacks. 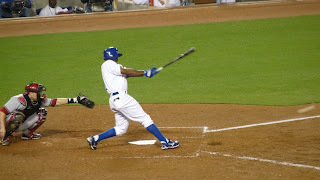 The game was pretty bad actually - we left at the 7th inning, but apparently the Dodgers started to come back at the bottom of the 9th inning (but the still lost). This afternoon was spent doing laundry and some cleaning - and my Nana treated Teenie and me to Wendy's for lunch after going to Trader Joe's. 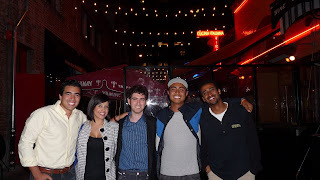 I also got to spend some time with Marcus, Julie, Prav and Randy tonight, and that's always enjoyable. Oddest moment of the night? Shawn Johnson of Olympic and Dancing with the Stars fame threw the (second) first pitch tonight at the ball game.